There are many patterns for basic raglan sweaters. Not all of them are top-down, and since I’m picky, none of them are written quite the way I like. 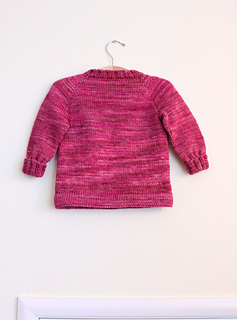 I’ve designed this pattern to be easy to follow and easy to customize. 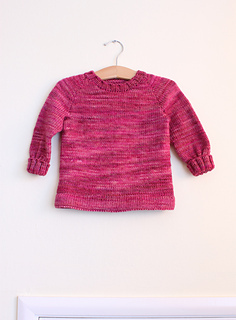 This is a kids’ crew-neck pullover with ribbed collar and ribbed or straight hem and cuffs. 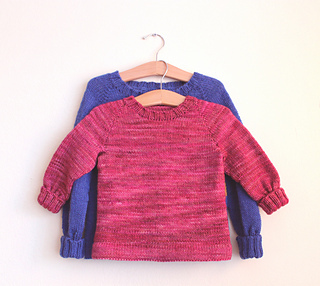 The ribbed version of the cuffs is designed to fold so that you can adjust the sleeve length as the child grows. The fit is classic and comfortable.